Faux fur collar and muff set from Peacockalorum on Etsy. 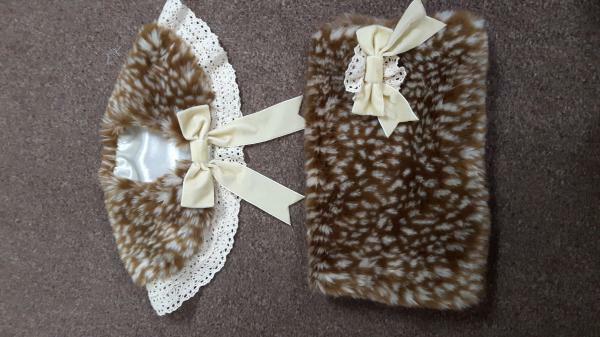 Deer print fur with cream lace trim and yellow velvet bows. Satin lining on collar, fleece lining on muff. The decoration on the muff can be removed as it has a brooch fitting. There is a small 1-2" section where the lining of the muff has come unstitched. Otherwise excellent condition. Would be happy to consider trades for any / all of my items listed.